If you’re on the lookout for the very best in bifolding doors, Basfords are your award-winning bifolding door experts. Our technologically advanced bifolding doors are amongst the very best you can buy. Each is specially selected to provide you with exactly the right door to suit your budget, design ideas, property and style. We offer an excellent choice of some of the best bifolding doors you can buy. Each is specially selected to provide you with exactly the right door to suit your budget, design ideas, property and style. Luxury, affordable bifolding doors from Basfords. The bifolding door is without question one of the most popular and desirable enhancements you can make to a home. There is no other glazed product that can truly transform a home with a door that is desirable, versatile, appealing and stylish. At Basfords we know you have a huge amount of choice when it comes to bifolding doors. It therefore makes sense not only to choose the right product but one that is professionally and expertly installed. Bifolding doors are highly engineered and complex products. When installed correctly and by a bifolding door professional, they’ll provide you with years of reliability and enjoyment. So whether you’re looking to replace your old sliding doors, change your French doors or are extending your home, contact us to see how we will work with you to transform your home. With our expert help and advice as well as our experience and knowledge you’ll soon find out why we are the local specialists in folding doors. Bifolding doors from the leading brands in the UK and the world. At Basfords we provide you with real choice. We offer three of the best known and trusted bifolding doors on the market. Each has it’s own unique features and benefits and we can help you choose wisely. In choosing Basfords, you’re dealing with an expert bifolding door Company that has many years experience in this specialist product. Origin Doors come from one of the leading bifolding door manufacturers in the UK. British designed and manufactured they are truly exceptional. Our Origin doors feature the finest locking systems, safety features, huge colour choice and are bespoke to you. What’s more they’re the only doors on the market with an industry leading 20 year guarantee. Find out more about Origin bifolding doors. The Schuco name is synonymous with engineering, performance and unlimited design freedom. Schuco doors benefit from cutting edge design. They are the product of choice for architects, discerning homeowners and designers the world over. Our range of Schuco bifolding doors can be made wider, taller and larger than many other doors on the market. You’ll often see Schuco doors as part of the stunning home renovation projects featured on television and in the media. Find out more about Schuco bifolding doors and how they can benefit you and your home. The Warmcore bifolding door is one of the latest innovations to hit the market. It features all the advantages of multi chamber PVCu internally with slim, strong and colour rich aluminium externally. At the heart of Warmcore is a highly insulated thermal core giving this exceptional door class leading thermal performance, excellent aesthetics and a choice of colours, hardware and opening options. Find out more about Warmcore bifolding doors. Basfords. A choice of bifolding doors few can match. Contact us today or visit our showroom and join the vast number of delighted customers that have improved their homes with an industry leading folding door from Basfords. Our range of bifolding doors enables Basfords to gives you real choice in bifolding doors few other companies can match. We offer doors designed to meet virtually any requirement with a high specification and at value for money. We have bifolding doors offering unlimited design freedom and technology. We even have the latest in cutting edge doors that enable you to choose the profiles that will work best in your home. All offer the quality, security and peace of mind you would expect when you invest in a bifolding door for your home. Visit our showroom and discover how a bifolding door can add real value to your home and how you use it. In our showroom you’ll find several folding doors installed in a number of residential settings to help you visualise these products in your own home. Only by visiting our showroom can you see how these impressive products slide and fold and feel to the touch. You’ll also see our bifolding door thresholds and we’ll help you understand why the bifolding door threshold is also important in connecting the inside and outside spaces. What’s more you’ll see the range of colours on display, the different bifolding door configurations as well as the choice of handles, glass and blind options available for you. 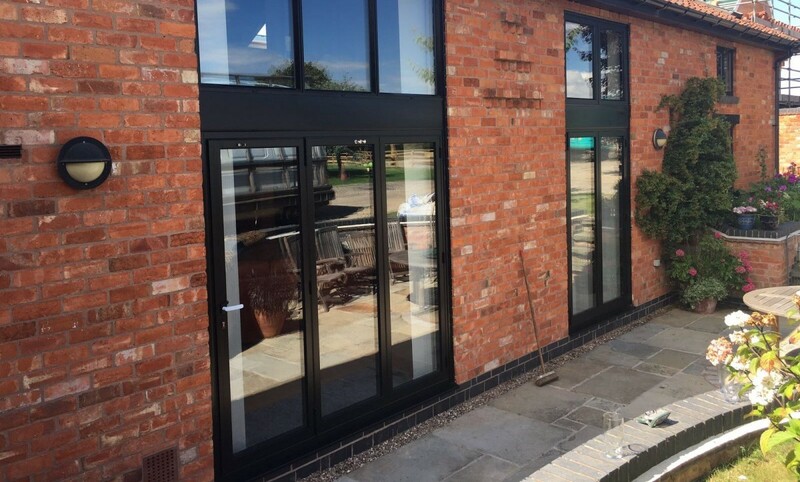 All of this, together with our expert help, friendly service and relaxed no pressure approach will help you understand bifolding doors better and help you make an informed buying decision. We look forward to welcoming you and to being of service. Contact us today or call 0115 895 4948 now.